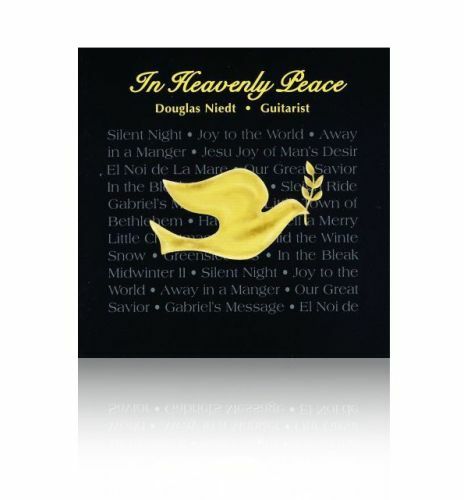 Douglas Niedt's In Heavenly Peace CD contains some of the most moving and creative solo guitar Christmas arrangements ever recorded. Doug spent two years researching Christmas music, composing these arrangements, and recording them for your enjoyment. Listen and experience for yourself the wonder, joy, and profound glory of Christmas. A special 12-page booklet is included in the CD detailing the stories behind the Christmas music. Only $12.98. Pay with credit card or PayPal. SPECIAL OFFER: Make your Christmas shopping easy! Give In Heavenly Peace CDs to all your friends and family at Christmas. Order 12 copies. Only $8.00 per CD. Total: $96.00 (plus shipping). Order In Heavenly Peace CD now. Only $12.98.